Mayor Nutter announced his plans for making Philadelphia the “greenest” city in America last month, highlighting five areas of interest and 150 initiatives he hopes to achieve by 2015. 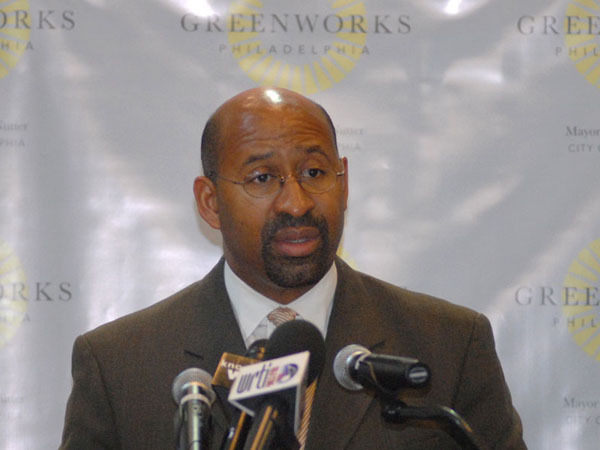 He has defined the ambitious plan as a restructuring of Philadelphia towards a “green economy,” which, if it lives up to its alternate meanings, could definitely help a city living through a recession. Dubbed Greenworks Philadelphia, the programs will focus on five E’s: energy, environment, equity, economy and engagement. For energy, the plan’s goals are to lower government building energy use by 30 percent, cut overall city building energy use by 10 percent and buy more energy from renewable sources. To help the environment, the plan is to cut greenhouse gas emission by 20 percent and divert 70 percent of solid waste away from landfills. Food access, a large problem for many of Philly’s residents, gets a nod, too, with a commitment to increasing the availability of fresh food and promoting farmers’ markets, community gardens and urban farms. Jobs, another big issue, are also mentioned in the plan, which aims to double the number of “green jobs” to 28,800.